According to the home page, rules for 2018 are going to be the same except for some restrictions on wings. Main wing will now have to be single-element and there is a size limit for it and for wing side plates. Additional wings are allowed, with a limit on total wing area. There’s still nothing about ground effects. Although the class is new to me, it has a history in the UK going back to 1967. Cars initially resembled US midgets in appearance, although independent suspension appears to have been popular. Rear engines have also been run since the early days but have not been universal. The historical photos don’t show any cars with radically offset engines through most of the history. Apparently nobody on the east side of the Atlantic ever heard of American Supermodifieds. It does appear that in 2017 somebody finally figured out that you want lots of left percentage on an oval track. The 48 car shown at http://www.arejayenn.com/gpmidgets/tome/2010s/2017/2017.php has a fair amount of engine offset, and a good sized overhead wing. More left percentage could be had by running a live axle and running the driveshaft just inside the left rear tire. The engine could then be between the left wheels. The class has also evidently had some presence on the continent, and there is a similarly named dirt track class in Australia. The Australian cars look vaguely similar to rear-engined UK ones but they use motorcycle engines and the rules are completely different. There are also US-style midgets in Australia and New Zealand. ROLL CENTERS ON A MODEL T? ANTI-ROLL BAR ON A MODEL T? Could you tell me how to determine the front and rear roll center for a Model T Ford? Most modern books only talk about the modern SLA suspensions. 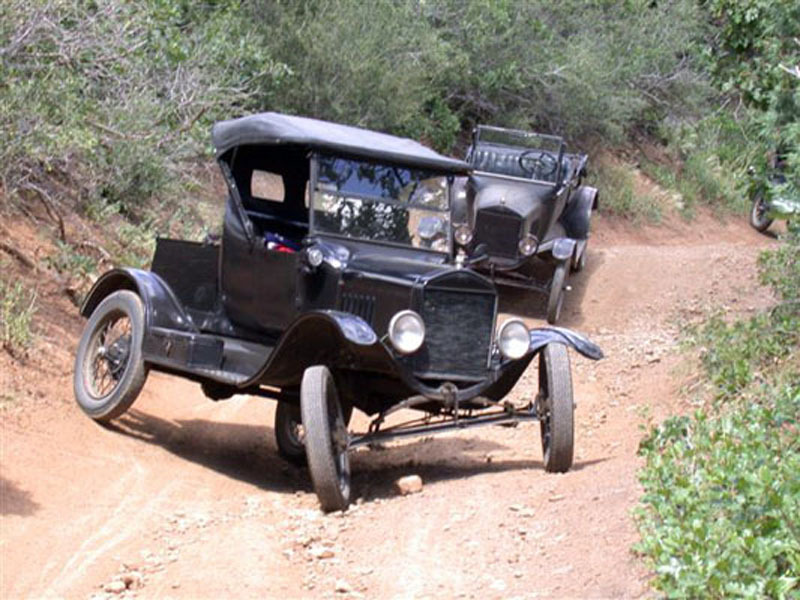 The Model T Ford has a buggy spring at both front and rear locations. The ends of each spring has one end of the spring shackle attached to it, and the other end of the spring shackle is attached to a perch that is attached to the axle. I do not know where to determine the roll center from. The line through the spring shackle were it attaches to the spring or the line through were the spring shackle attaches to the spring perch. Or is there another factor used to determine the front and rear roll centers of a Model T Ford? If you could publish just how and where the actual roll centers front and rear are located it might help anyone interested in the old car original suspensions. I think the "buggy spring" suspension (side to side single spring) was used on many early vehicles. Many books discuss solid rear axles with orientation of the leaf springs mounting points ahead and behind on each side of the rear axle, but do not discuss a single spring attached to the left and right ends of the axle. What about the advantage/disadvantage of installing an anti-roll bar to the front axle? I know from an historic point of view it would be out of place; this car is otherwise stock, not a hot rod. But would it work? The Ford transverse leaf spring suspension provides a roll center a bit below the upper portion of the spring. It is hard to pin down the location exactly, because the system doesn’t really locate the axle very precisely in the lateral direction. The spring has shackles at both ends. To provide really positive lateral location, it would have to have a shackle at just one end. As it is, theoretically the axle can roll a little about a front view center of rotation defined by the intersection of the front view shackle centerlines, without deflecting the spring at all. It will tend to do this when acted upon by a lateral force. The axle can also roll a lot more, deflecting the spring, about a center of rotation defined by the spring. Actual roll when cornering is a combination of these two types of motion. Here’s a picture of a Model T in a condition of extreme warp displacement. It appears that the axles are rotating about points pretty close to the spring mount on the frame. However, there is no cornering force present in that picture. The car is sitting still, on a very irregular surface. Lateral axle location with this system depends heavily on the converging radius rods that locate the axle longitudinally, and on the rigidity and wear condition of the shackles. In stock form, the radius rods converge to a single pivot ball on the car centerline. For the axle to move laterally with respect to the frame, it has to pivot about that point. One end of the axle has to move forward and the other end rearward for that to happen. The shackles and the spring have the job of resisting this. That depends on the shackles being rigid in the XZ (longitudinal-vertical) plane despite their having to be able to rotate in the YZ (transverse-vertical) plane to let the suspension move. If we replaced the shackles with drop links, the whole system would become very wiggly. When the shackles get worn, the system starts to act like that. It also becomes wigglier laterally when we split the radius rods to install a modern engine, as is common in hot rods. The Model T spawned a brisk trade in all manner of aftermarket accessories and modifications, including some intended to improve the suspension. These included various types of additional springs. Some of these added stiffness and some made the springing softer. I don’t know of any torsional anti-roll bars being tried, or any other springs that would do the same thing. Would anti-roll bars work? Sure. You could add them in front, in back, or both. They’d do the same thing on that car as on any other: stiffen the springing in roll and warp; add lateral load transfer when cornering on the end you stiffen and reduce it at the other end. To add roll resistance yet retain the warp softness of the original configuration, it would also be possible to use longitudinal anti-roll/anti-heave Z bars as on Packards, front and rear anti-roll U bars with hydraulically connected telescoping drop links, or diagonal anti-roll/anti-pitch U bars. What the Model T really needs most urgently is some form of damping. It’s got no shocks. The only damping is the friction between the spring leaves. There were early damping devices sold for the car in its day. If I were designing a transverse leaf spring and wanted to use it to locate an axle, I think I’d give it little enough arch so it was close to flat at design ride height, have no shackle at one end, and use a shackle or a drop link at the other end. To add roll resistance without adding a separate anti-roll bar, the spring could be attached to the frame at two points rather than one, as in some Fiats, Maseratis, and Corvettes. One of these attachment points has a locating pin and anchors the spring in three axes. The other attachment point has rolling or sliding contact with the spring and constrains it only in the X and Z axes. In synchronous wheel movement, the spring deforms in a U shape: when the ends go up, the middle goes down. In oppositional wheel movement, one end goes up, the other end goes down, the middle stays in the same place, and the spring deforms in an S shape. The spring thus has a higher rate in oppositional displacement than in synchronous displacement, similar to a conventional spring and anti-roll bar. When using such a spring to laterally locate the axle, the end nearest the pinned mount would get a shackle or drop link, and the end nearest the unpinned mount would just have an eye. Everywhere). The three link suspension won’t have this problem. Also, three links are statically determinate. How the loads are shared between four links will depend on the relative stiffness of the links and the structure they are attached to; how this is analysed is beyond me. On an historic note, cars built in the 20s such as the Vauxhall 30/98 used a torque arm offset to the right, whether to counteract torque wedge or just to clear the driveline I don’t know, but it’s interesting to note that the foot brake operated on the front wheels and a transmission brake at the back of the gearbox, and the rear brakes were operated by a handbrake. As a practical matter, verifiable experimentally, a system with four trailing links and some additional lateral locating device will not bind in roll within the travel limits imposed by the joints and the various other packaging constraints involved, if and only if the links are parallel in both side view and top view. They are that way in the illustration shown, but that isn’t necessarily obvious to the eye. If the links converge or diverge toward the front of the car in top view, then there will be some bind in roll as described by the questioner. With rigid rod ends, it doesn’t take a very big deviation from parallel to produce a bit of bind. Some years ago, I had the opportunity to observe this. The shop next to mine was occupied by a sprint car builder. We had a sprint car frame with front suspension up on a table, with no springs, shocks, or wheels installed, so the suspension could easily be moved around by hand. The suspension had four long leading links and a Panhard bar. The leading links were parallel in side view but not quite parallel in top view. They were a bit further apart at the axle than at the frame. They splayed out at the front by about three inches per side. The suspension had a slight bind in roll. It wasn’t enough to prevent you from moving the suspension large amounts in roll with your hand, but you could feel a little resistance. Then we removed the top left leading link. There was then no resistance at all. After that, all of the builder’s cars had no upper link on the left. It is pretty common to have a long torque arm just to the right of the drive shaft. This was used not only on Vauxhalls in the ‘20’s but Bugattis as well. More recently, it was used on Camaros. Such an arm is too long and not sufficiently offset to provide very much cancellation of torque roll, but there is a little. It makes more sense to have the arm on the right than on the left.